I've just booked my flight to Frankfurt for this year's fair. I love the fair but I can't say I love getting there. It's a 22.5 hour journey from Melbourne, Australia, which is enough to test the patience even of a bookworm. 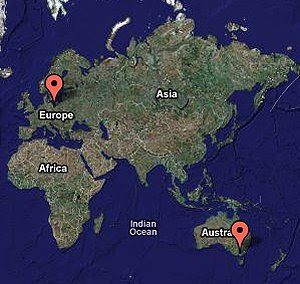 I normally feel pretty sorry for myself until I meet a New Zealander - they have even further to travel. So my questions are: how far are you traveling to get the fair this year, or what is the furthest you've ever traveled to get there? And by what means? Feel free to share. Fortunately, I have a direct 9 hour flight from Houston to Frankfurt. since the flight carries on to Luanda, My fellow passengers are likely to be rig workers and oil company execs on their way to Angola to work in the oil fields there...Houston's like that, with connections to all sorts of out of the way destinations where there happens to be oil. Lagos, Alaska, Dubai.